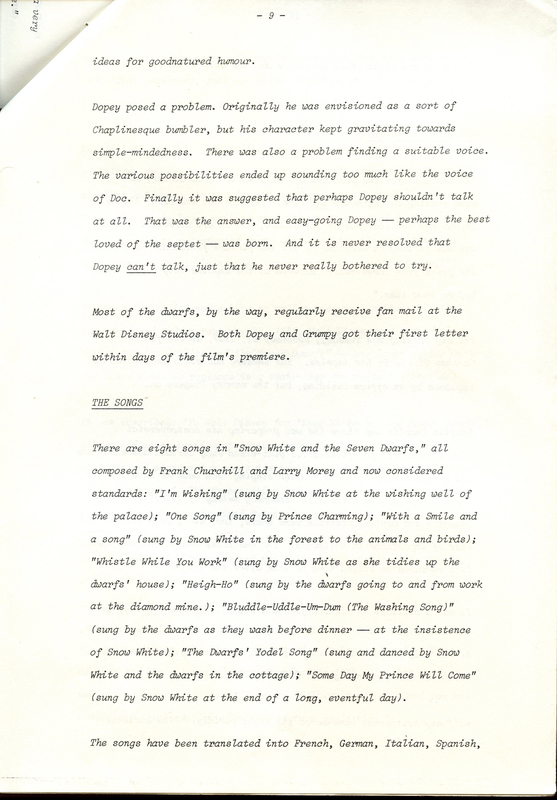 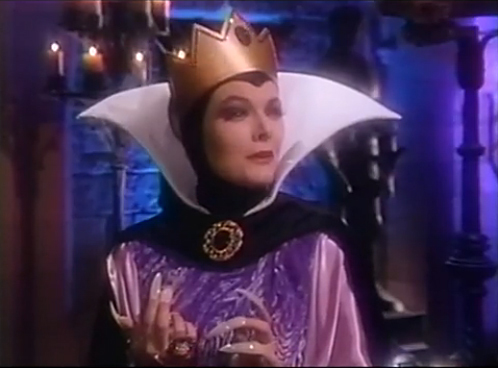 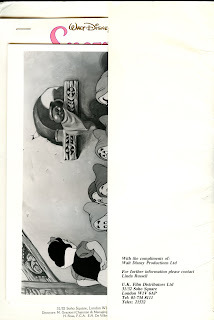 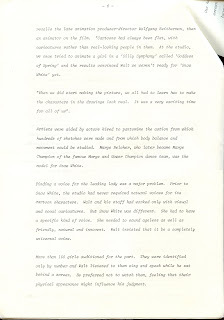 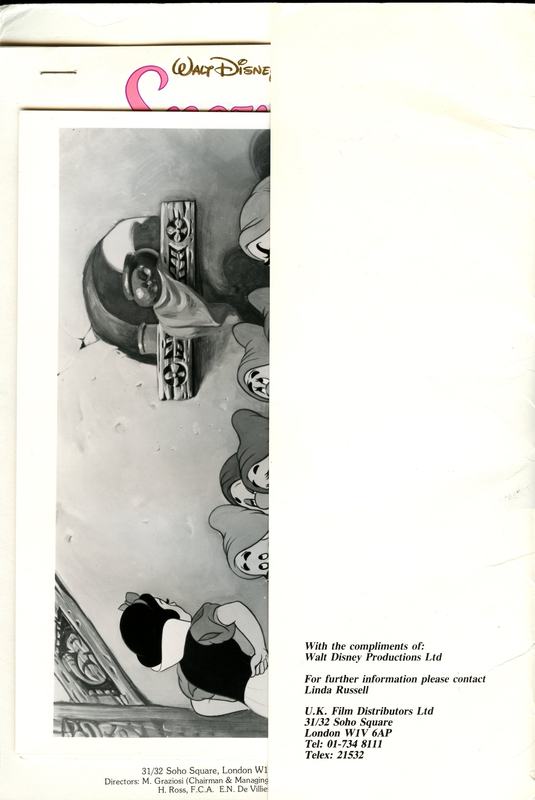 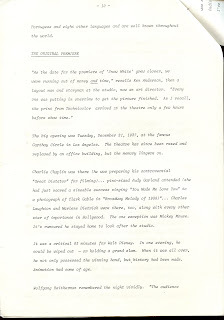 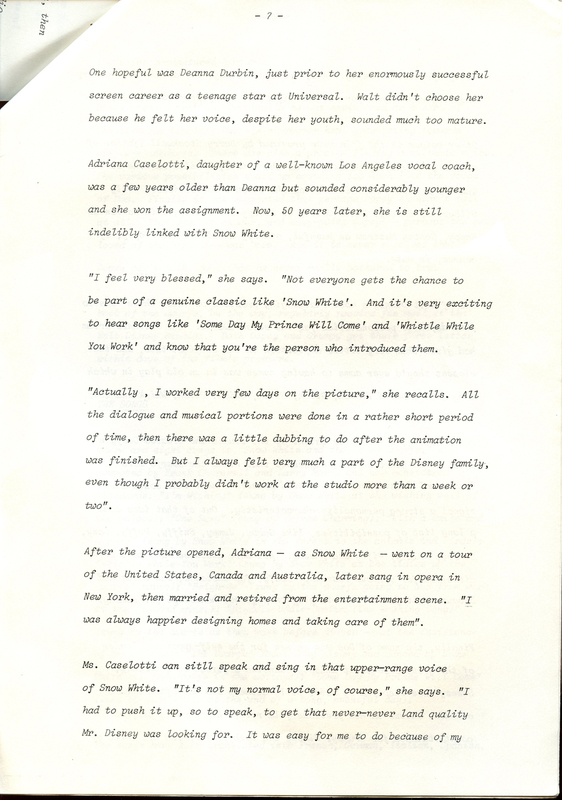 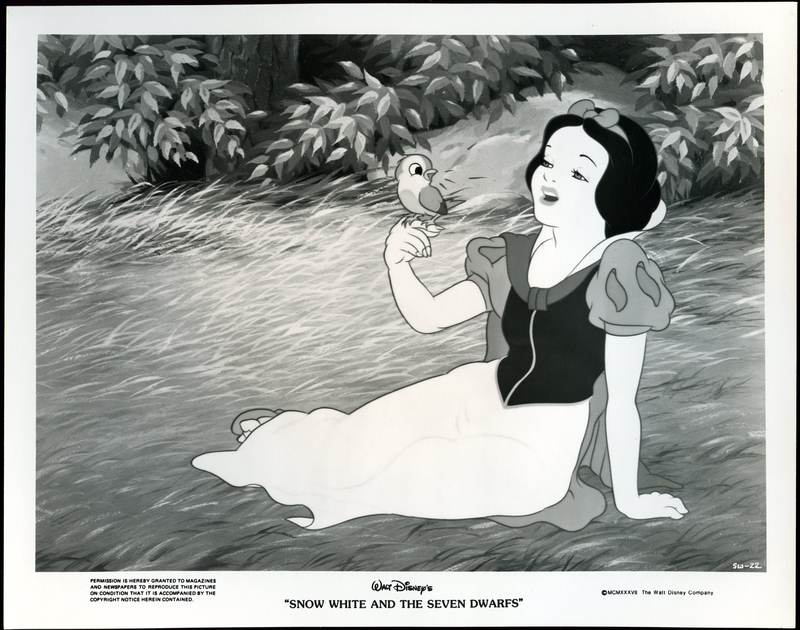 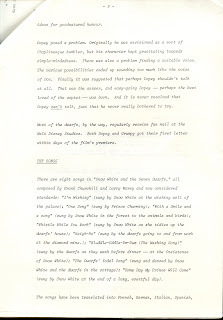 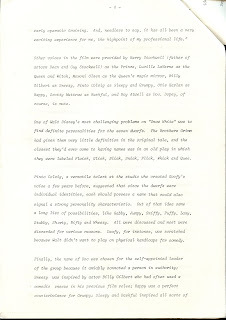 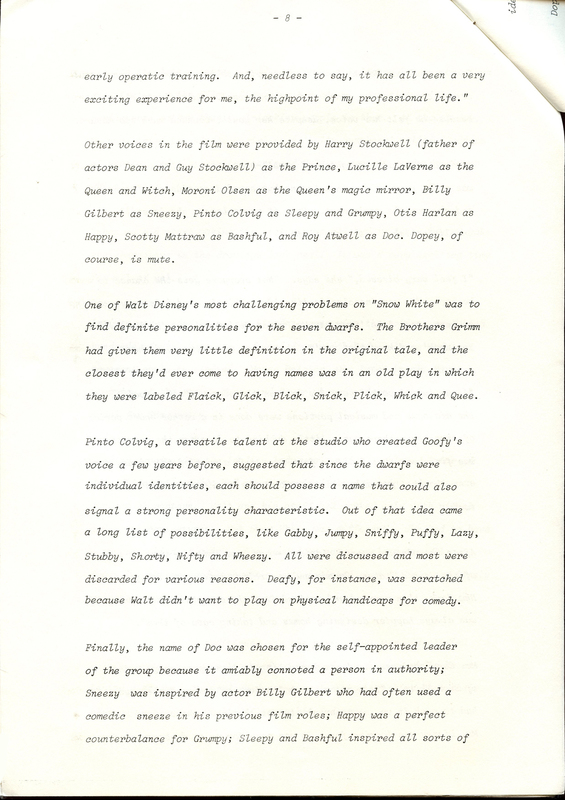 This press kit was sent out to media outlets in the United Kingdom for the 1987 theatrical return of Snow White. 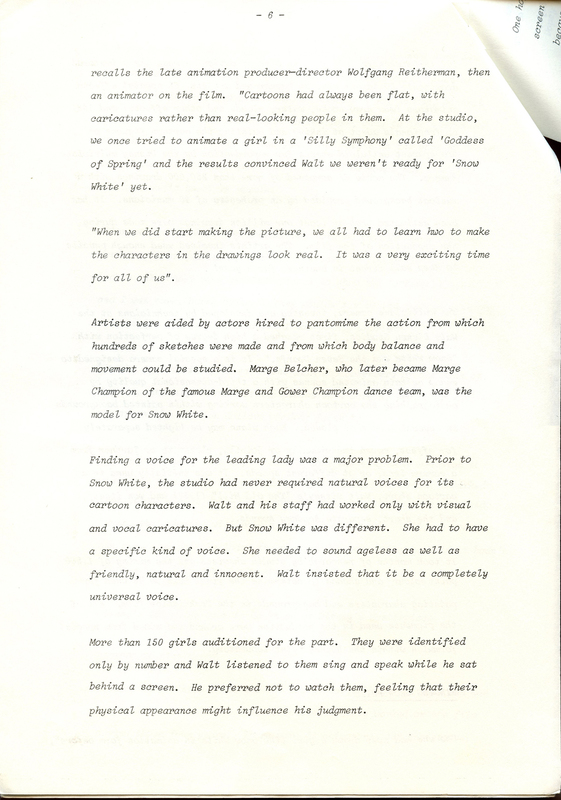 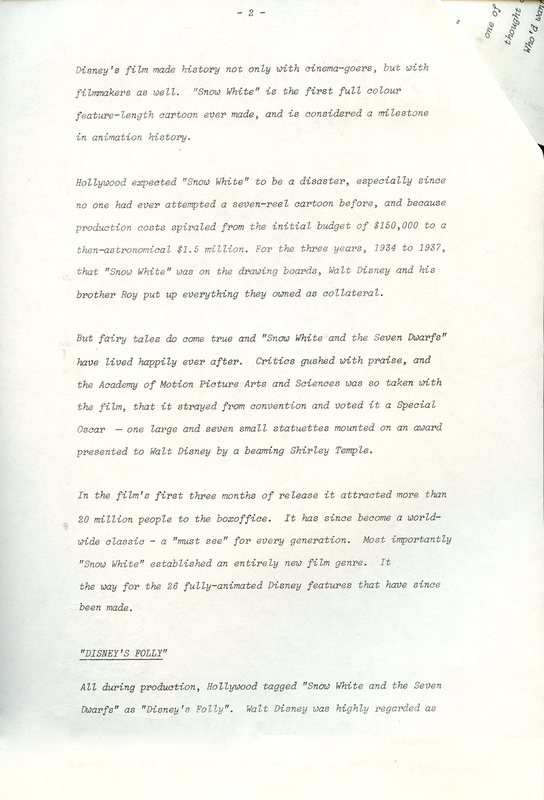 The film was released through U.K. Distributors Ltd., and the enclosed promotional materials included a fold-open synopsis card with movie credits on the back, five B+W 8x10 photos, and eleven pages of production information,. 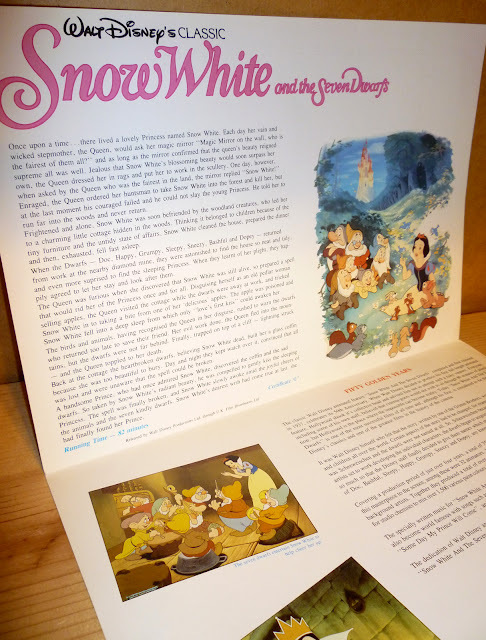 The folder featured a nice "show-your-hands" graphic of Snow and the boys on the front cover along with the 50th Anniversary logo. 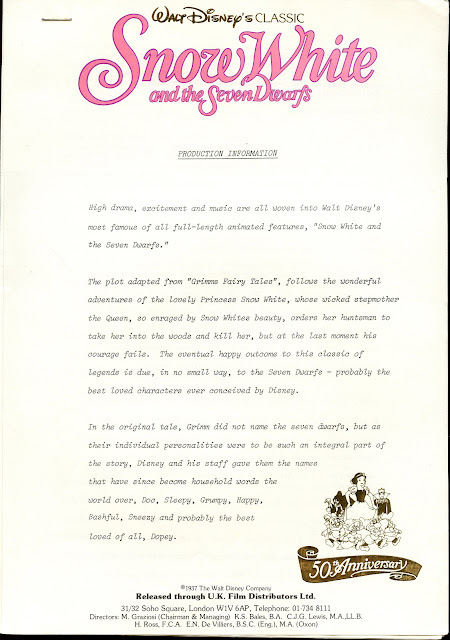 The promotional materials were tucked under the inside flap where the contact info for U.K. Distributors was printed. 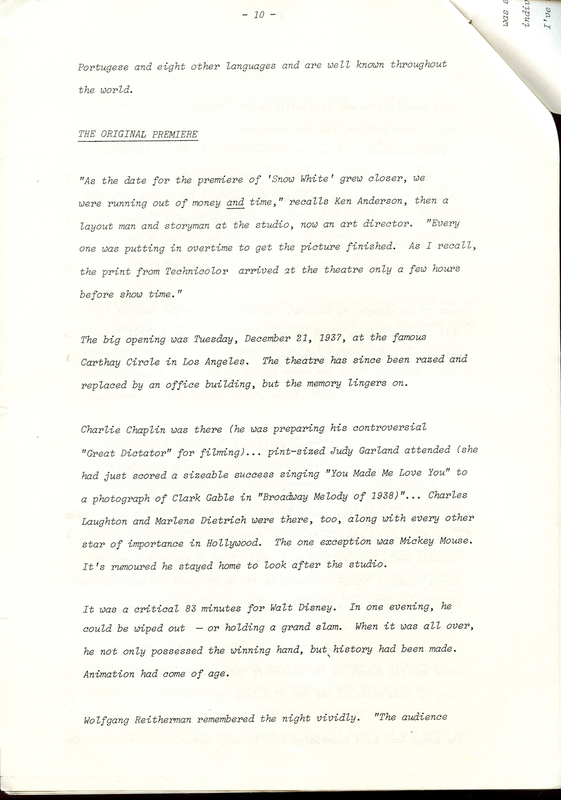 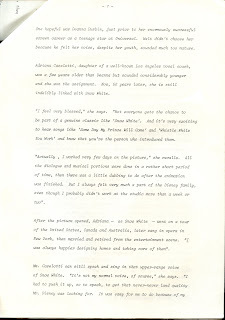 The fold-open card includes the story synopsis and info on the film's making in condensed form. 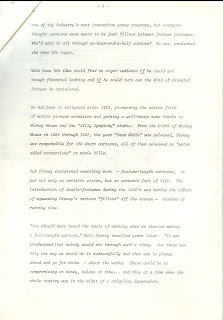 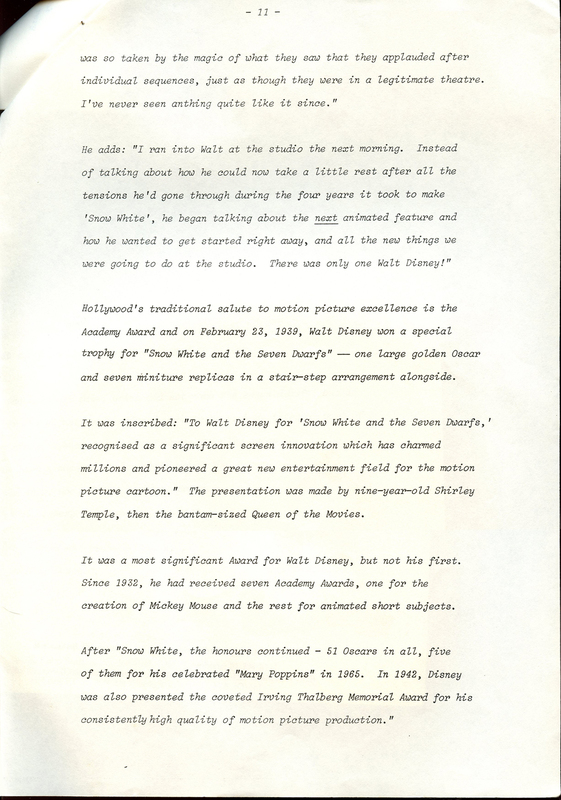 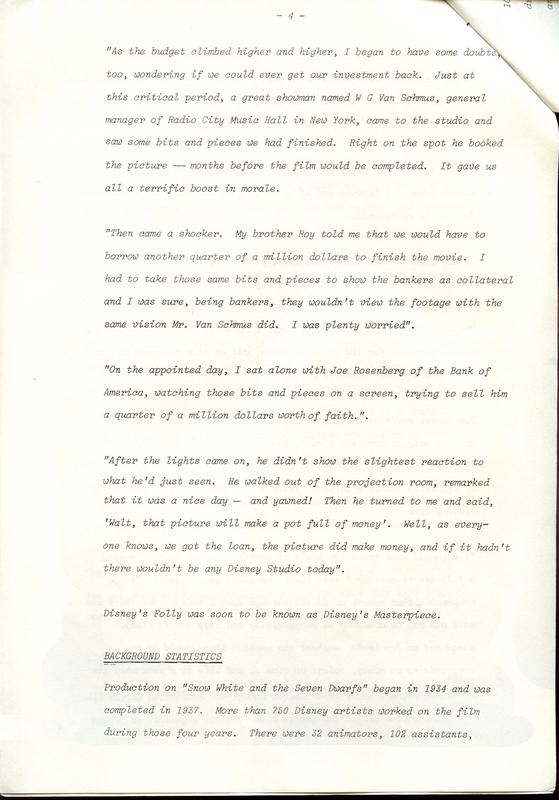 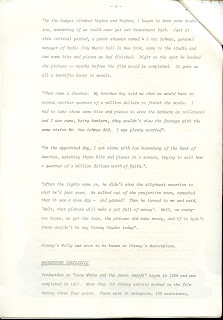 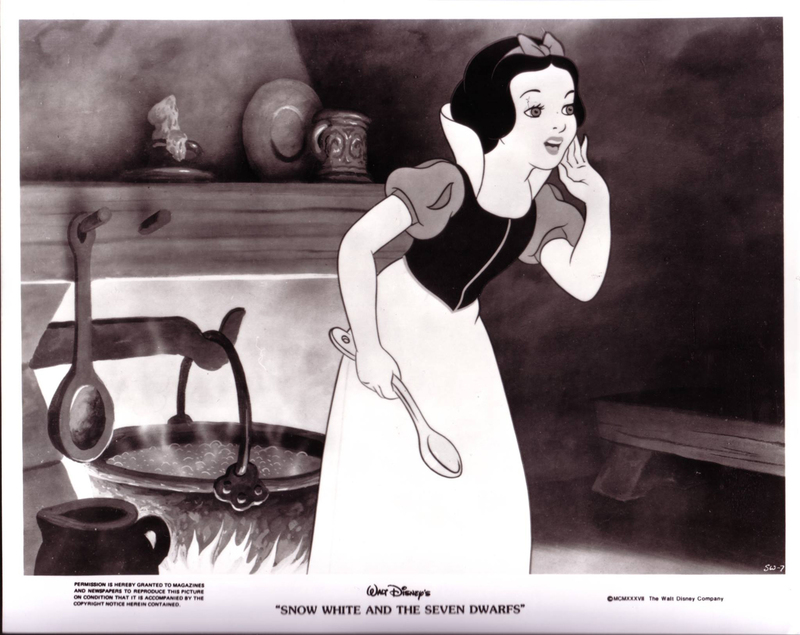 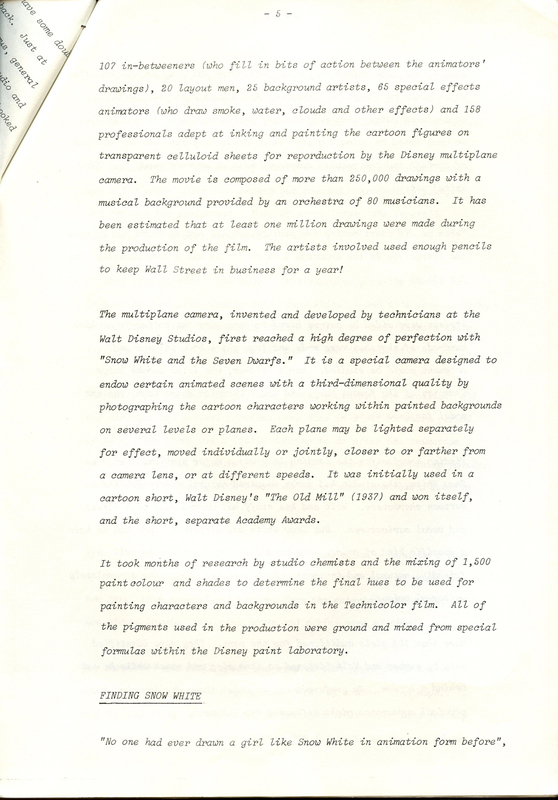 Printed in the lower right corner of all the B+W 8x10s is the year in Roman numerals and the Disney copyright, "©MCMXXXVII The Walt Disney Company"
The eleven pages of production information highlight the making of the film and the hoopla of it's initial 1937 premiere. 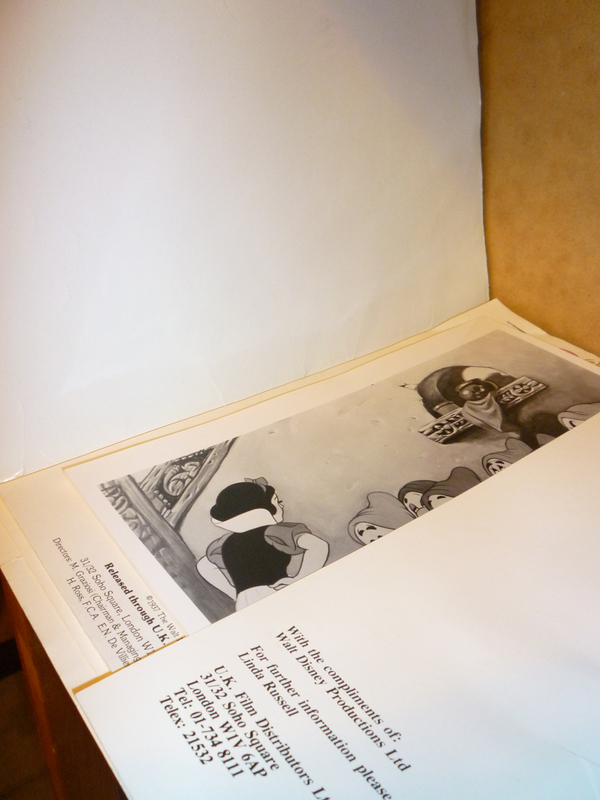 Each page is printed on the A4 international standard size paper of 210mm × 297mm (8.27" × 11.69"). 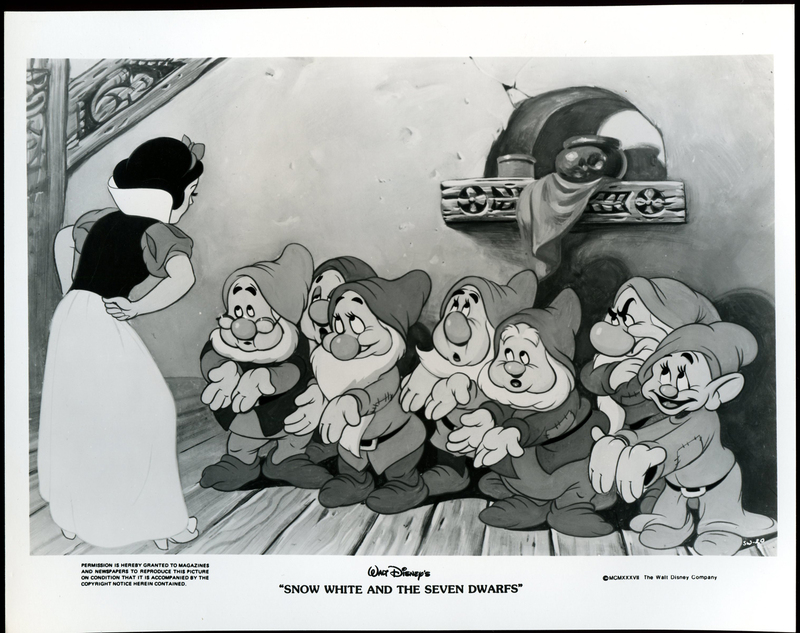 UPDATE: Collector Nunziante Valoroso shares a couple additional 8x10 promo photos from his collection. 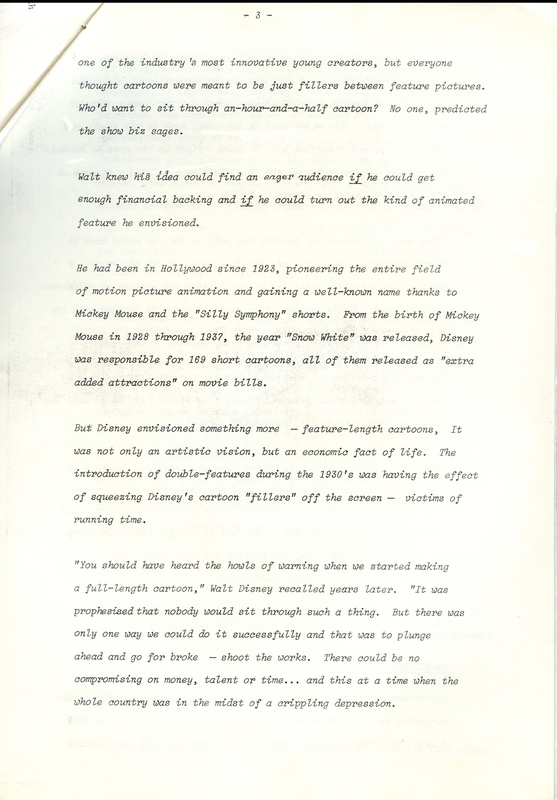 They contain identical markings along the bottom edge as those seen above, placing them to this same time period. 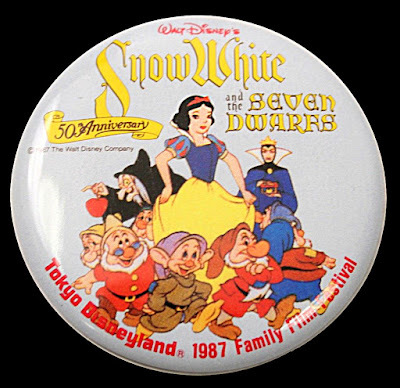 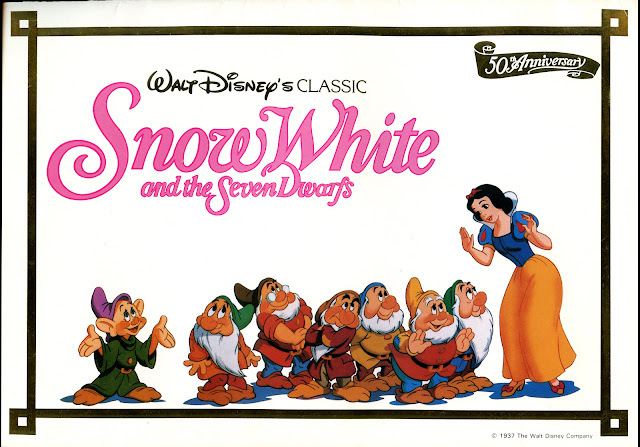 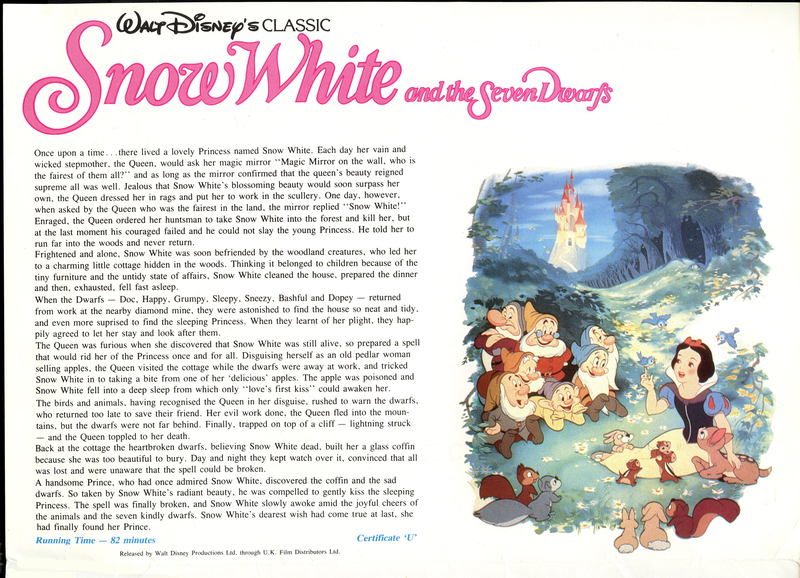 In 1987, One Stop Posters distributed a Snow White 50th Anniversary button and a series of other commemorative buttons to mark the occasion. These were also the guys responsible for this giant-size, 'in-your-face' door poster. 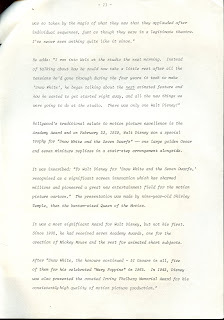 At 26" across and 72" long, this is absolutely the largest piece of memorabilia I've ever tried to run through my pint-size scanner. 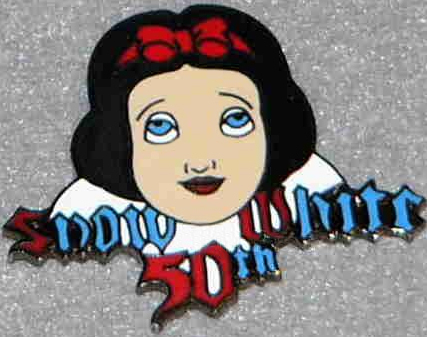 It took forever...but it was certainly worth it. 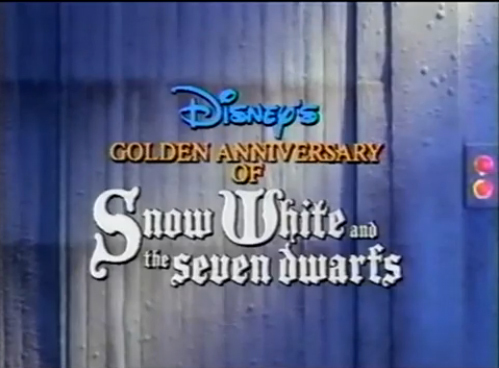 Six feet down in the lower left hand corner is the One Stop logo and info. 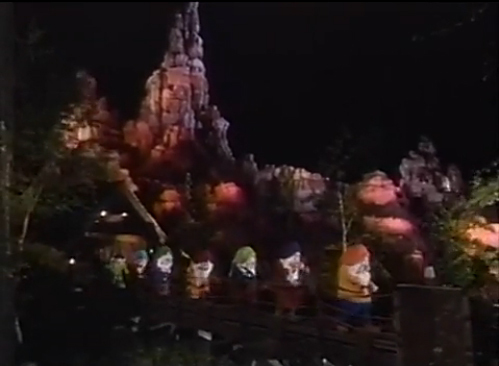 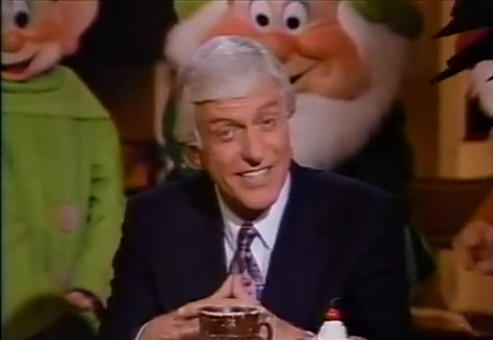 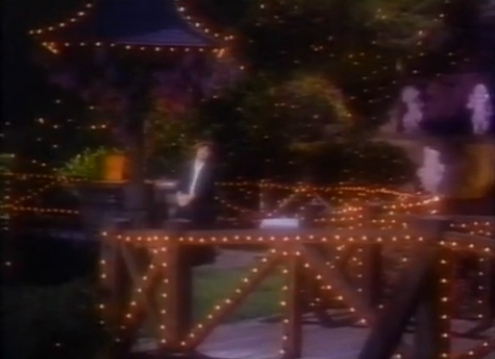 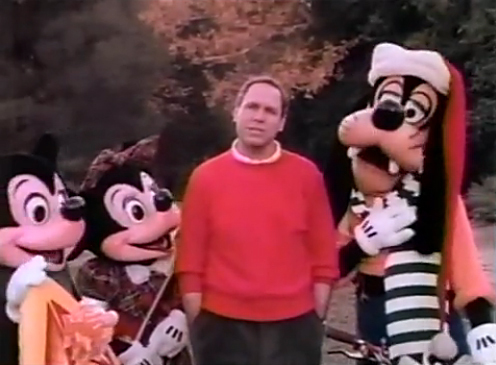 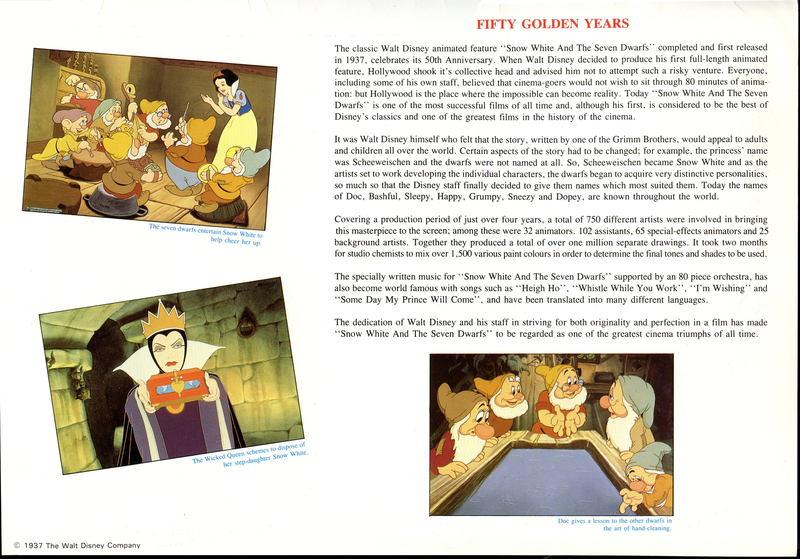 The lower right has the Walt Disney Company 1987 copyright. 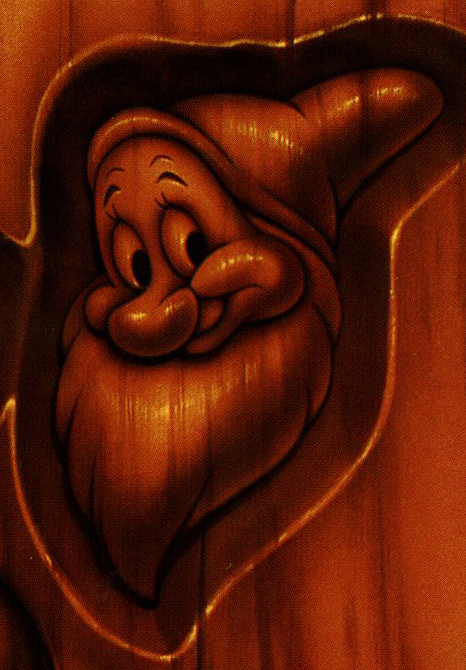 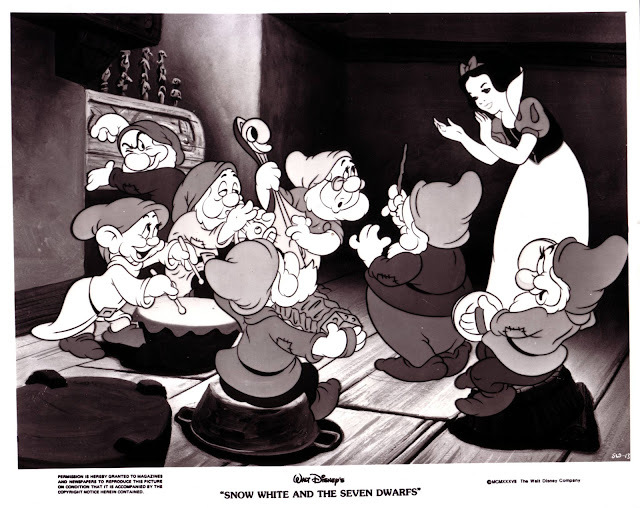 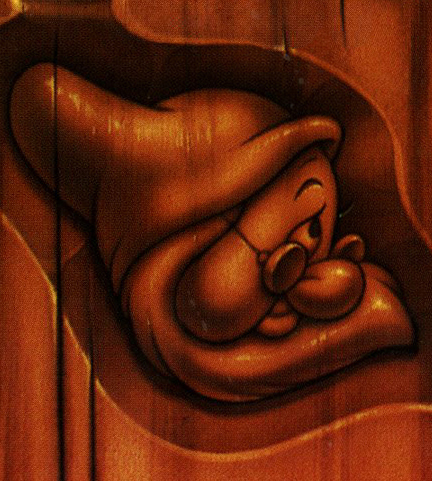 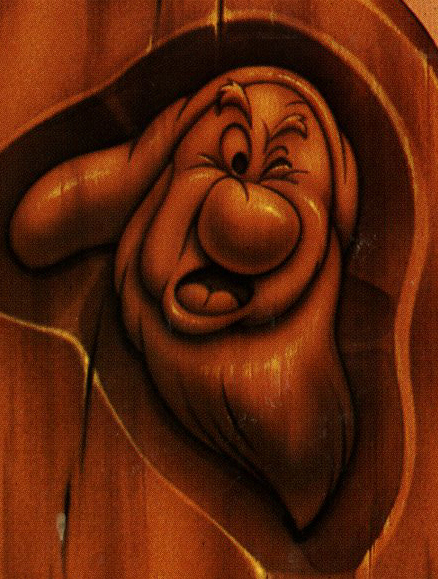 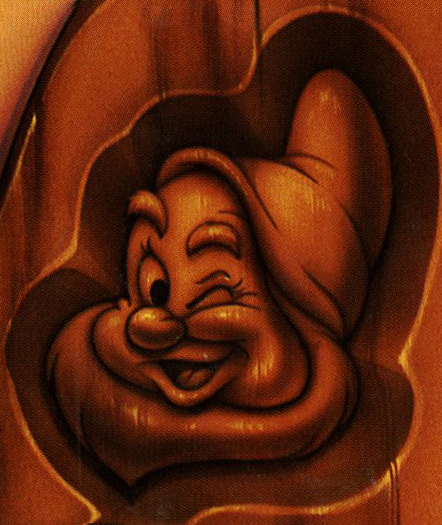 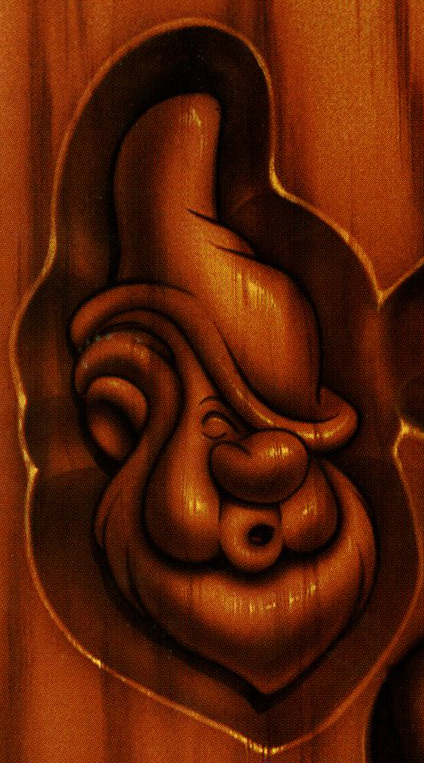 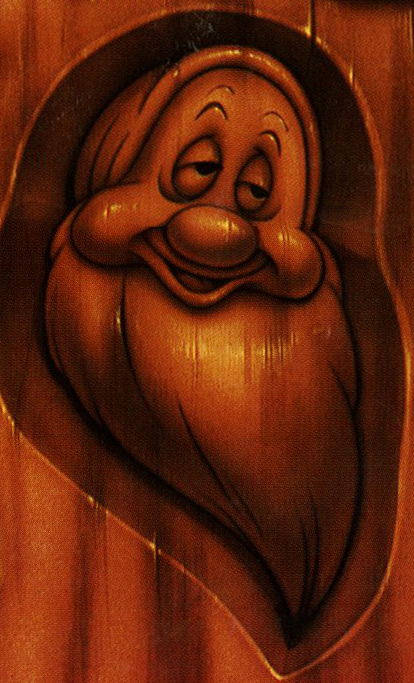 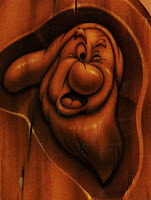 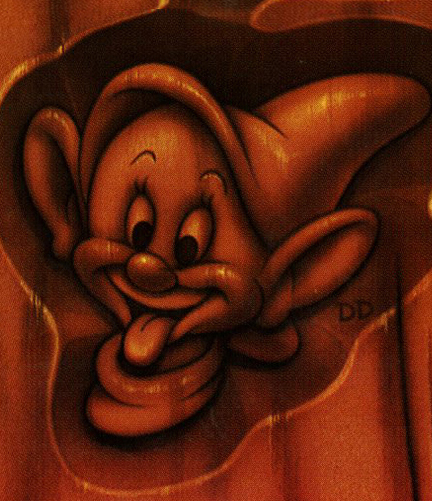 The artist's initials "DD" are placed next to Dopey's "woodcut" image. Although Snow White's milestone proceeded the theme park pin-trading craze by a good 12 to 13 years, Disney, and other official licensees, did issue a number of pins (and buttons) to mark the occasion. 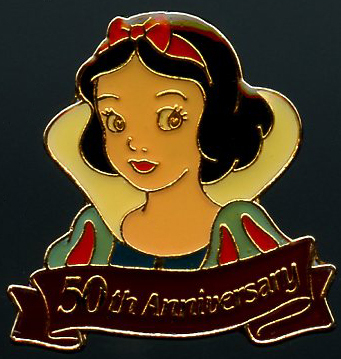 This "50th Anniversary" cloisonné was sold to guests at Disneyland for $3.00. 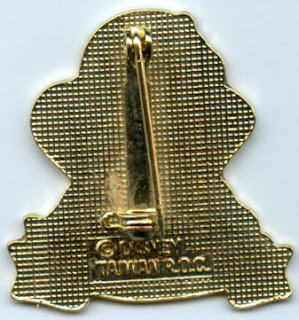 The pin measures about 1.25" x 1.25" and the reverse side reads "© Disney, Taiwan R.O.C." 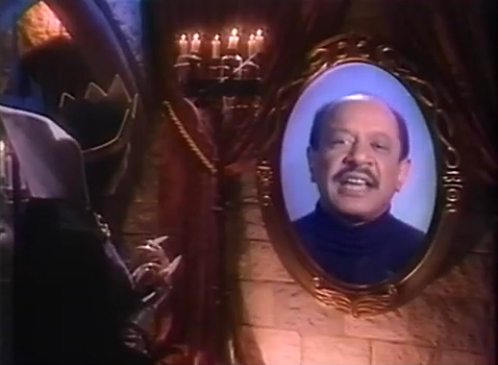 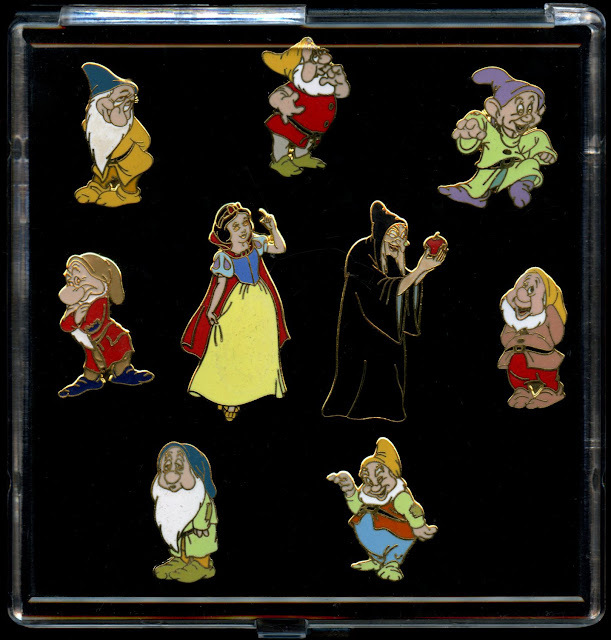 Today all Disney pins are post-backs and in 1987, most were too. Yet, this one is a pin-back. A 9-piece commemorative set exclusively for cast members was available for purchase at the Walt Disney Studios in Burbank, the Company D store at Disneyland, and possibly other cast member locations. 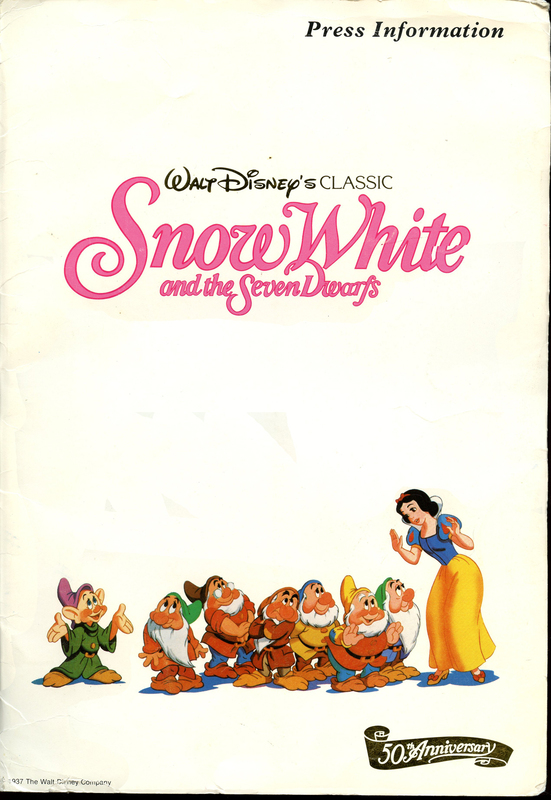 They stand approximately between 1" to 1.75" tall and contain "© Disney, Taiwan" on the backside. 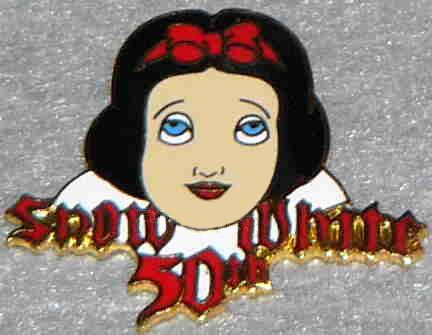 Three near identical and slightly scary-looking "Snow White 50th" pins were also issued as cast member exclusives. The trio differ only in their word coloring. 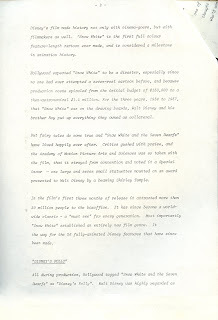 The back reads "© WALT DISNEY COMPANY." 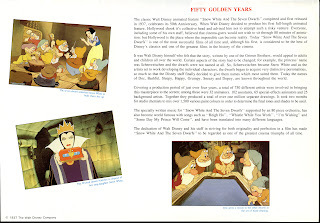 SW 50th Triplets. Images via Pin Pics. 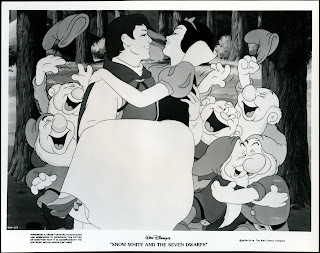 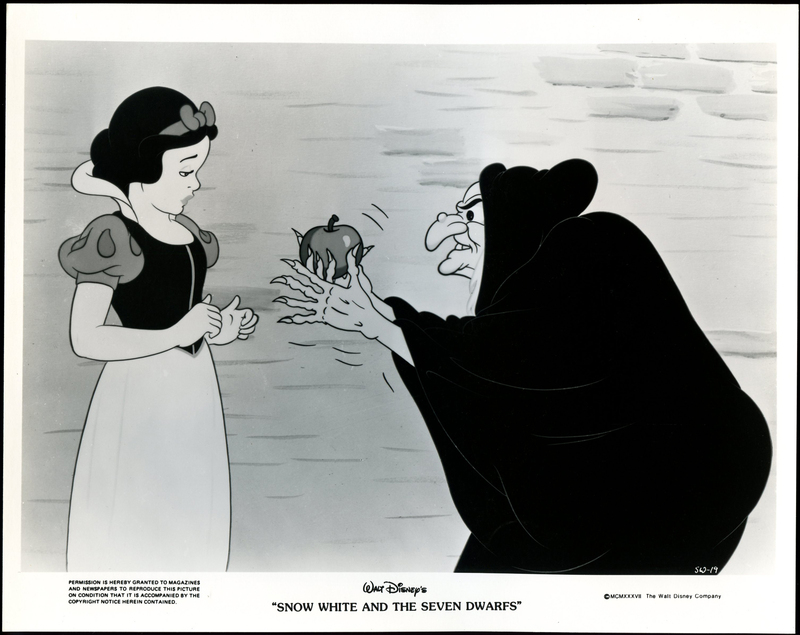 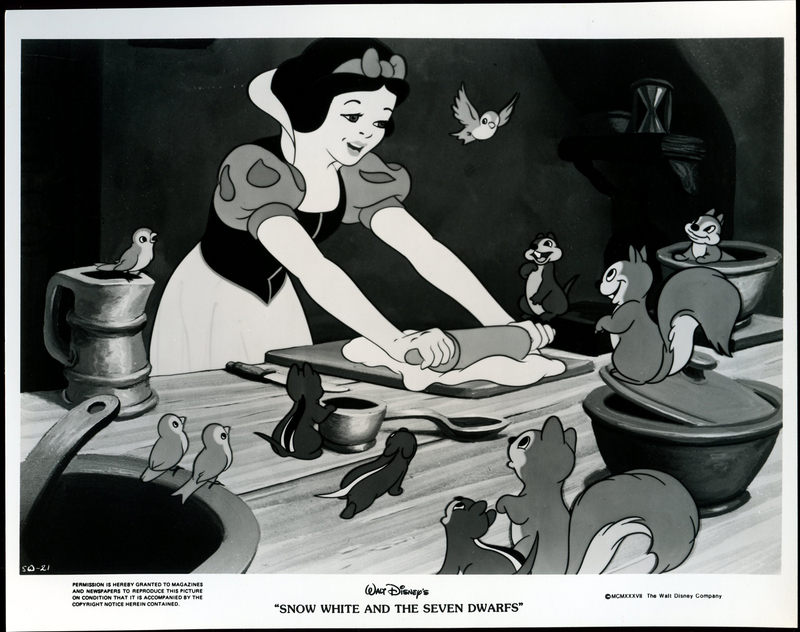 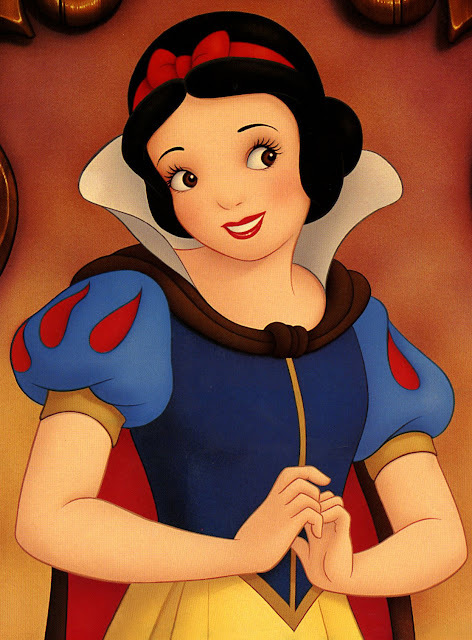 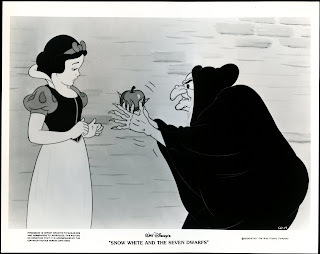 A couple of pins were released that read, "Disney's Golden Anniversary of Snow White and the Seven Dwarfs". 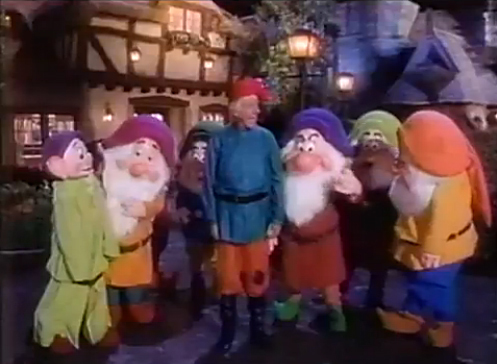 One had a pink background, the other green. 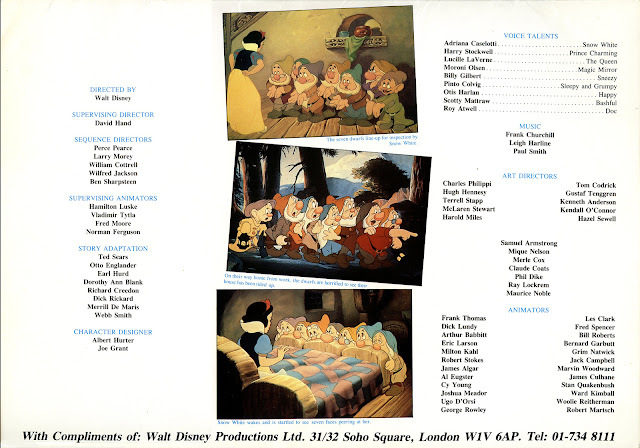 The back is stamped "© 1937 The Walt Disney Company". 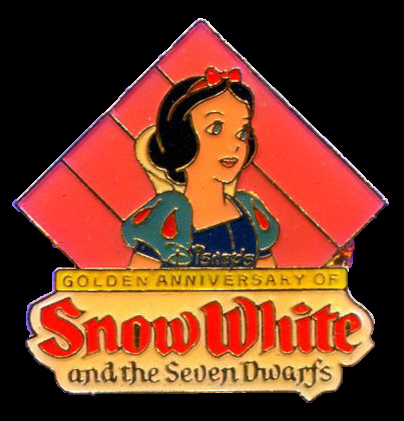 The Golden Anniversary insignia--featuring the dwarfs encircling Snow White with Witch and Queen in the background--was available on two different pins. The first is quite rare and was sold at the Mouse Club/Disneyana Convention that year. 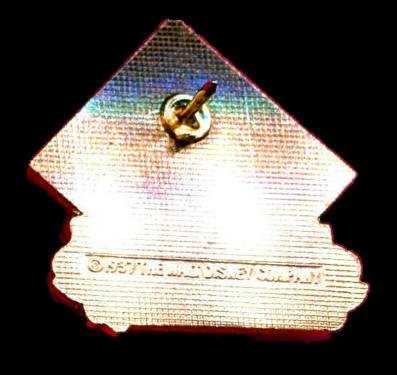 It measures 2" x 2" and reads "1987 WD" on the back. 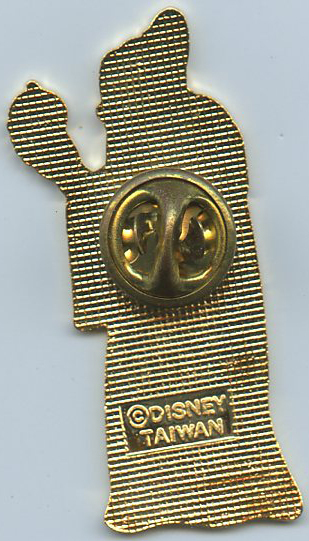 The second insignia pin came in two sizes: 3" and 1.5". The artwork is identical to the button seen below. 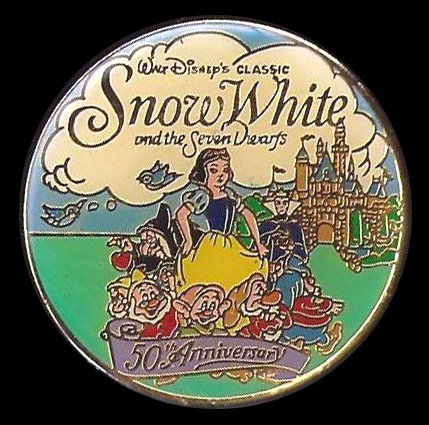 The 50th Anniversary logo button measures 3" across and has a pin-back. 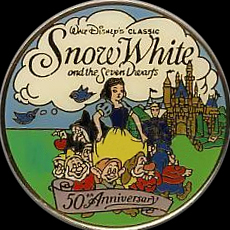 Along the rim reads "© 1937 The Walt Disney Company - Distributed by One Stop Posters"
Also see the other Snow White buttons and poster distributed by One Stop during this time period. Tokyo Disneyland issued a button featuring a variation of the anniversary graphic with text along the bottom that reads "Tokyo Disneyland 1987 Family Film Festival." 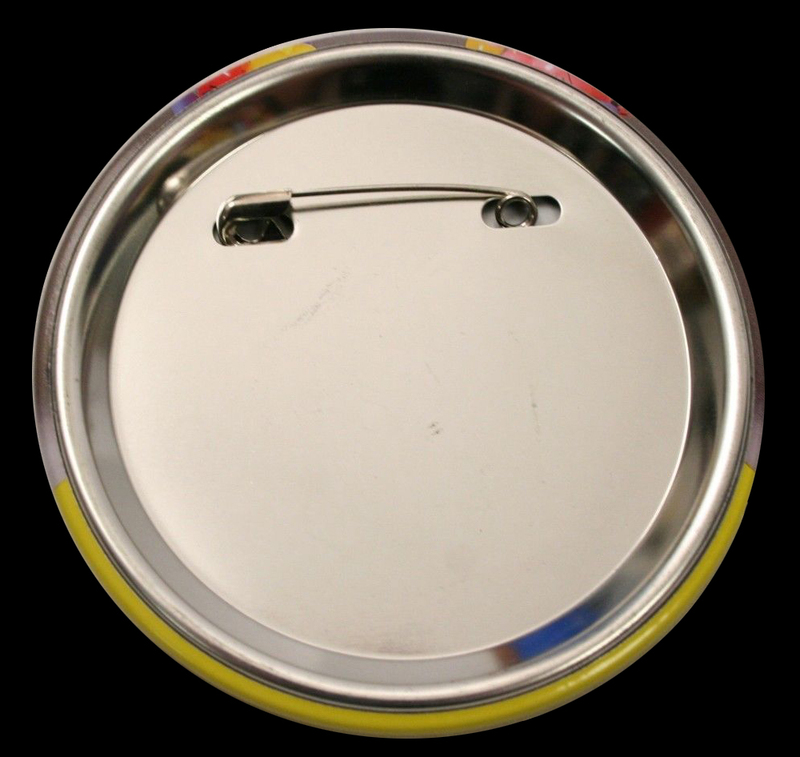 Measures 3" in diameter. 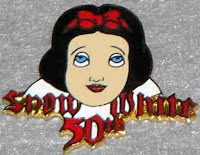 Finally, this is a button worn by McDonald's employees to help promote their Snow White charity posters. 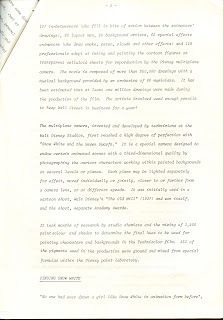 McDonald's button images via vintagenewsstand. 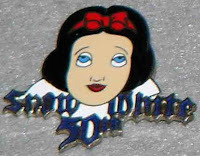 Also see the special "50th Anniversary" name tag that cast members wore for a limited time at Disneyland.